After landing at Windhoek International Airport, you are welcomed by our representative and transferred into the city. En route to your hotel, enjoy a short city tour. Windhoek, Namibia’s capital, nestles among rolling hills, bounded by the Eros Mountains in the east, the Auas Mountains to the south and the Khomas Hochland in the west. It is a blend of Africa and Europe, the modern and the old. The capital’s main street is a mix of well-preserved German colonial buildings and modern architectural styles. Herero women in their traditional Victorian dresses mingle with executives dressed in the latest fashions. Check in to the hotel and relax. After breakfast, you return to the airstrip for your private light aircraft flight south into Damaraland. During the transfer to the camp, keep an eye out for some of the exceptional species of flora and fauna that can be found here. You arrive with time to freshen up and settle in before lunch. This afternoon you can either enjoy a guided walk in the local area or a guided excursion to the ancient Twyfelfontein rock engravings and the interesting geological sites of Burnt Mountain and the Organ Pipes (or there is plenty of time to do this tomorrow if preferred). At Twyfelfontein, some 2,500 prehistoric engravings that depict wildlife, animal spoor and abstract motifs are scattered on boulders over a hillside amongst flat-topped mountains of red sandstone. These boulders and slabs of red sandstone hold perhaps the largest and finest collection of petroglyphs in Africa. The engravings show animals such as elephant, giraffe, kudu, lion, rhinoceros, springbok, zebra and ostrich that once used to drink from a fountain at the bottom of the hill. In some cases, footprints were engraved instead of hooves or paws. The abstract motifs feature mainly circles. Stone tools and other artifacts found at Twyfelfontein suggest that hunter-gatherers occupied the site over a period of perhaps 7,000 years. A local guide accompanies you to showcase the rock art. The engravings lie along two circular routes, one an hour’s climb and the other 40 minutes longer. Twyfelfontein is one of Namibia’s key National Monuments and has recently become a UNESCO World Heritage Site. A rounded hill a few kilometers from Twyfelfontein and the Organ Pipes, known as the Burnt Mountain, seems to catch fire again at sunrise and sunset. Its fantastic range of colors is due to a chemical reaction that took place roughly 125 million years ago when molten lava penetrated organic shale and limestone deposits, resulting in contact metamorphism. In ordinary sunlight it is a dull black. Blackened rubble lies to one side like cinders. After an early breakfast, you are transferred to the airstrip for your private light aircraft flight south to Wolwedans Dune Lodge. The flight takes you along the Skeleton Coast, flying over ship wrecks, seal colonies and old diamond mining camps. You will also fly over the great sand sea and stopover in Swakopmund to refuel before passing by Sossusvlei and landing at Sossusvlei Lodge airstrip. Here you will be met by a local guide who will take you on a magical excursion into the Namib Naukluft National Park, entering the park gates in the late morning. 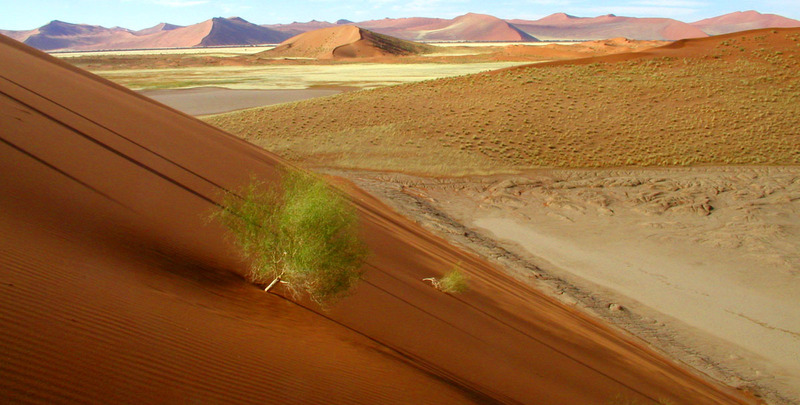 Sossusvlei itself is actually a clay pan set amidst these star shaped dunes, which stand up to 300 meters/984 feet above the surrounding plains, ranking them among the tallest dunes on earth. This area boasts some of the highest free-standing sand dunes in the world. Your guide will give you an insight on the formation of the Namib Desert and its myriad of fascinating creatures and plants that have adapted to survive these harsh environs. Once you have explored the dune fields to your heart’s content, you will be transferred to Sossusvlei lodge in time for delectable lunch before returning to the airstrip and continue on your short flight to the Wolwedans airstrip. You are met by your local guide, who drives you to the lodge.